Moto X may not be the cheapest phone available in the market. It costs $199.99 with a two-year agreement, which may sound a little high as customers can easily get a smartphone with better specifications for that price. Earlier this month, several retailers reduced the price of the highly customizable Moto X to $99 with a two-year contract. 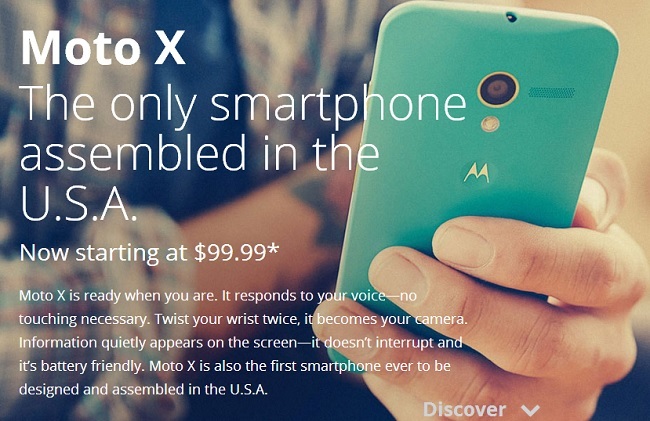 Now, it seems that Motorola decided to slash the price of Moto X to $99 on-contract when bought via Moto Maker. In addition Sprint and US Cellular also reduced the price of the Moto X to $99.99 with a two-year agreement. Even if you visit the Moto Maker website, you wil be greeted with a $99 price tag for the AT&T model. US Cellular is also offering users a $75 if they opt for a new line and port their phone number to the carrier, bringing the cost of the handset down to $24.99. Now, this is a deal worth going for if you can bear on its network. On the other hand, the 32GB version is also down to $149.99 on-contract. The Big Red — Verizon Wireless — is still offering the handset at the same old $199.99 on-contract price. Unfortunately, the black and white ready to ship Moto X is still available for $199.99 with a two-year contract. This sounds a little strange as the customized model costs $100 less than the usual colors. To recall, Moto X comes with a 4.7 inch display, a dual-core Snapdragon S4 Pro chipset clocked at 1.7GHz with Motorola’s X8 Mobile Computing System, 2GB RAM, 10MP ClearPixel camera, 2,200 mAh battery and runs Android 4.2.2 Jelly Bean on top of it.